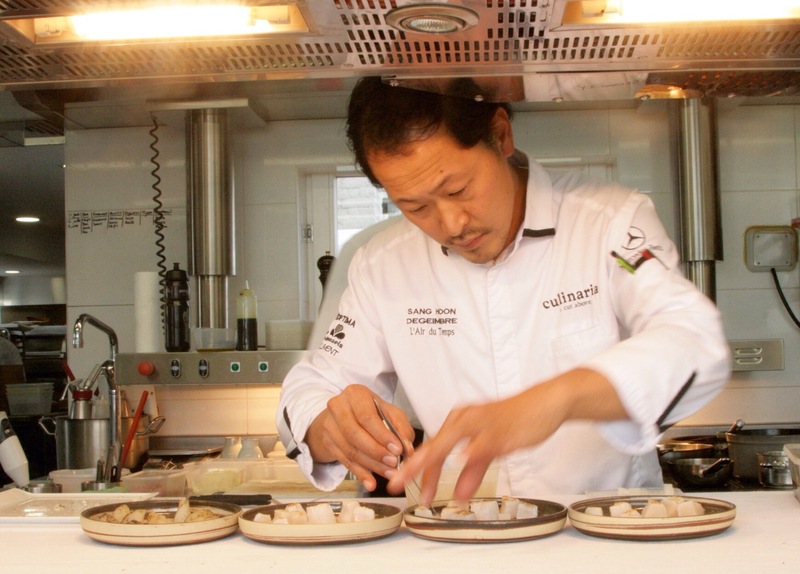 Updated: Brussels foodies have something to look forward to after the summer holidays as chef Sang-Hoon Degeimbre of the 2 Michelin starred restaurant L’Air du Temps in Liernu announced he will be opening his second restaurant SAN in the Belgian capital. The date for the opening of the restaurant has been set for 5 October. On the website of the new restaurant there is a photo of Sang-Hoon with a countdown and a small note saying San is coming to Brussels. San Bruxelles have announced that the bookings for the Brussels based restaurant will open on 15 September. Sang-Hoon, considered to be one of the best Belgian chefs and famous for his molecular cuisine as well as his love for exceptional produce, will offer a completely different experience to L’Air du Temps. His restaurant in Liernu is in the middle of the Belgian countryside. He loves the feeling that the countryside gives and when I had interviewed him he had told me: “Sometimes when I come here early in the morning I just head to the garden and just look at the sunrise and the countryside and that is really something special. ”But he also loves to feel the buzz of a city and that is why he lives in Brussels, the city in which he is opening his second restaurant. This opening in Brussels will make his unique cuisine more accessible to clients who might not otherwise take the trip to Liernu. 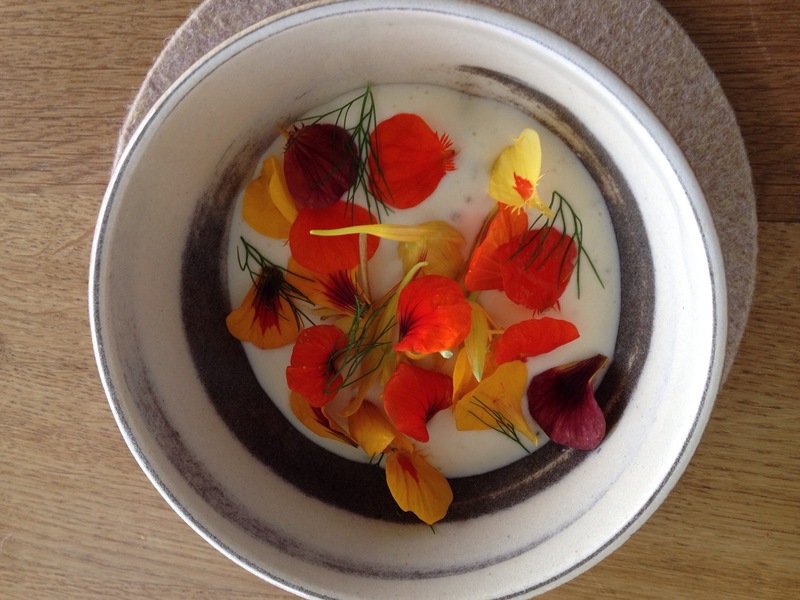 As he had explained to me, his aim is to offer food in bowls, something he has been experimenting with in the lunch menu at L’Air du Temps. He wants the food to be more accessible and the experience less ‘gastronomic’ than what you would expect in a Michelin starred restaurant. But he will still focus on quality produce and use the same cooking techniques. When I experienced what he had in mind in November I was immediately won over. He used the bowl to force you to use a spoon and therefore get you to pick up all the flavours in one spoonful. This means you experience a combination of flavours in your palate. He loves the use of the bowl because it is something each and everyone of us is familiar with in home cooking. The restaurant will open in Rue de Flandre, close the the centre. It is one of his preferred areas of Brussels and his restaurant will join an array of excellent restaurants you can find in this area of Brussels. The idea is to offer six different bowls every day. One of them will be Korean and the rest will change depending on the seasons, the produce he finds and the inspiration he gets from his trips abroad. He wants to be able to offer bowls from different cities with the aim of offering a taste of a particular city in a spoonful. If you want to know more about Sang-Hoon Degeimbre read our interview here. And if you want to be inspired by this Belgian chef you may want to look at 10 things we learnt from Sang-Hoon Degeimbre.